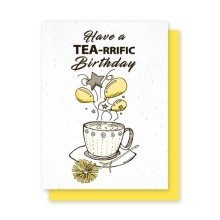 Plantable Chamomile ... Each tea themed card is embedded with chamomile seeds. 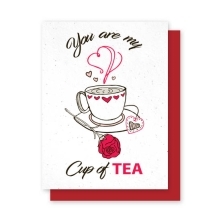 The recipient can plant the card in the ground and grow their own tea .Planting instructions are printed on the back of every card. 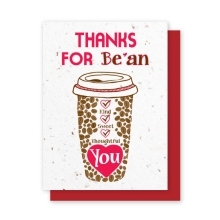 Roasted coffee beans… Each coffee card is embedded with the chaff from the roasted beans. 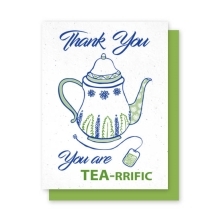 The beautiful flecks appear randomly throughout the card. 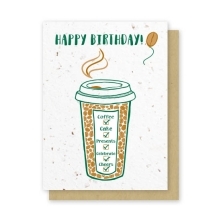 Truly unique... Greeting cards made for the beverage connoisseur, guaranteed to make a long lasting impression on the recipient. Variety... 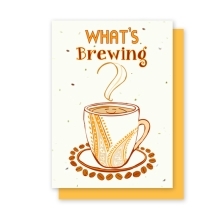 Choose from an assortment of 3 tea and 3 coffee themed cards, each sentiment corresponding to the seeds or beans embedded in the individual cards. Artistically created... Handmade by skilled artisans, one sheet at a time in San Diego, CA.